If you’re looking for a pocket knife that does it all, you’ve probably thought about getting a Swiss Army Knife. There are many to choose from, and it can be hard to pick among them. Victorinox is the only remaining maker of Swiss Army knives, but their monopoly status hasn’t caused them to let their world-famous quality lapse. 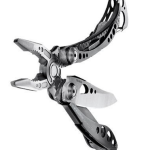 Instead, they are still producing several popular lines of knives from affordable basic ones to high-end multi-tools. The Victorinox Champion Plus comes in at the mid-range level, but most users will be just as happy with it as with models that are more expensive. The Victorinox Champion Plus has a full set of tools for any task a hunter, camper, fisherman, hiker or almost anyone may need. This knife comes with 30 useful tools. On the right side of the knife are the standard long blade, a Philip’s head screwdriver, and a can opener. On the left are the standard short blade, a flathead screwdriver, a bottle opener, a wire stripper, a magnifying glass, a metal file, a saw, a fish scaler, and scissors. On the bottom are a corkscrew, an eyeglasses screwdriver, a large screwdriver, a stitching awl, and a multi-purpose hook. Embedded in the two sides are tweezers and a ballpoint pen, and it has a key ring. All this is packed compactly packed into Victorinox’s famous form factor. The body is made of aluminum with a nylon handle. 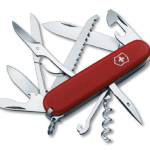 Typical of Swiss Army knives, it is approximately 3.5 inches long. 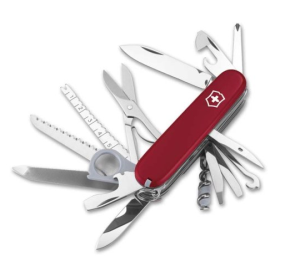 Like all of Victorinox’s products, it was made in Switzerland and comes with a lifetime warranty. To test the Victorinox Champion Plus, I decided to take it on a six-day camping trip I had planned. This was going to be an arduous journey, and I wanted to see if the knife was up to the challenge. Before leaving, I slipped the knife into my pocket. The first thing I noticed was that it really feels nice in the hand. It felt wider than the Swiss Army Climber knife that I take on most of my trips. For this trip, that’s fine, but it’s not a knife you’ll want to carry around day-to-day if you wear tight pants. It’s a great knife for workers or campers, but not something you’ll carry to the office. On the other hand, it’s the perfect knife to keep in the car for any emergency. Another issue was that it was a little hard to open the tools, but this could be because I have small fingers. During my trip, I really put the knife through its paces. I had a chance to try out the saw, and it cut through small branches in no time. The multi-purpose hook was useful for getting tight knots loosened. This is the first Swiss Army knife I’ve owned with a magnifier, and I’m glad to have it. It’s great for reading small print on topographic maps. I prefer sleeping under a tarp rather than a tent. One night I found a rip in the tarp, but I was able to use the stitching awl to punch through the tough canvas and sew it up. The scissors feel small and flimsy, but they’re really very strong. I was able to cut through 10-pound fishing line with them. The best thing about the knife is that, even after using it regularly on a long trip, the blades were all razor sharp including the scissors. 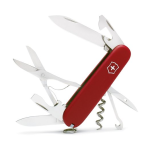 Swiss Army knives are made of high-quality steel and don’t need won’t need to be sharpened for up to a year. On the whole, I was impressed with the features and build quality of the Victorinox Champion Plus. It fits a lot of usefulness into a small form factor, and it comes at a low price. Victorinox makes a lot of great knives for specific purposes, but this is an excellent tool to have nearby to deal with any emergency. 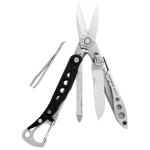 It should satisfy anyone who needs an all-purpose tool for his or her daily work or for adventures far from home.